Another way to save some money is to make your own mixes. I have been making my own taco mix for a few years now. I got the following recipe from a friend and I love it. 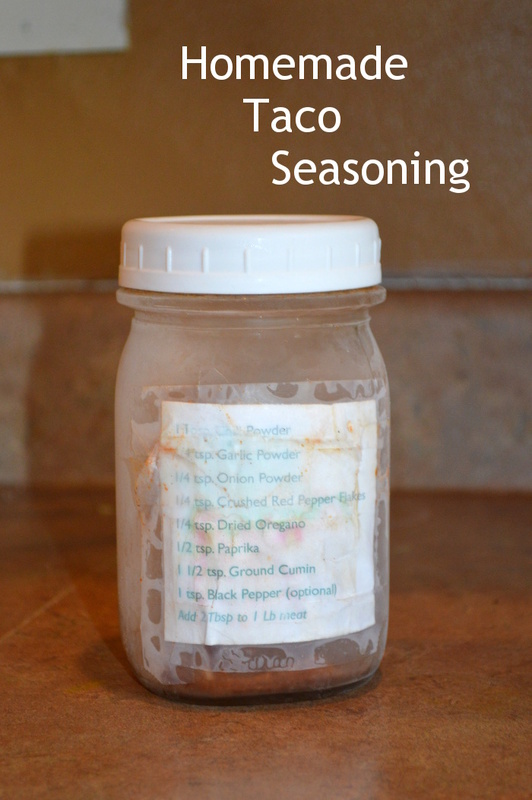 I even printed out the recipe and taped it to my jar for reference. As you can see it's been used a few times. I don't add the black pepper because it makes it a little spicer and the husband isn't a huge fan of spicy. I really like this recipe because I can double it, triple it or make it pint sized! I try to make a bunch at a time and fill a pint jar and then store it in the freezer. That way I have some stored up for later. If you do make a large quantity, mix 2 TBsp of the mix with about 2/3 cups of water. Then mix in with your cooked meat like you would your normal taco mix. I love trying new ways to make homemade mixes, what are some that you have made?